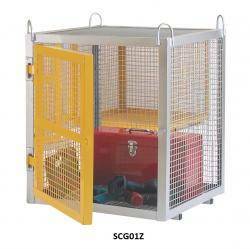 The cages are based on a standard 2.1m width and 2.0m height with a varying depth. All the cages are of a modular design with fully welded 5mm thick panels which are delivered palletised for assembly on site . 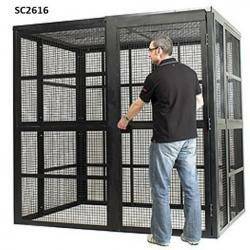 Once assembled the cage will resist the most determined of attacks. The steel 1m wide door has a Mortice Deadlock with a steel panel shielding the mechanism to prevent tampering with the lock. The door is positioned on the 2.1m face.